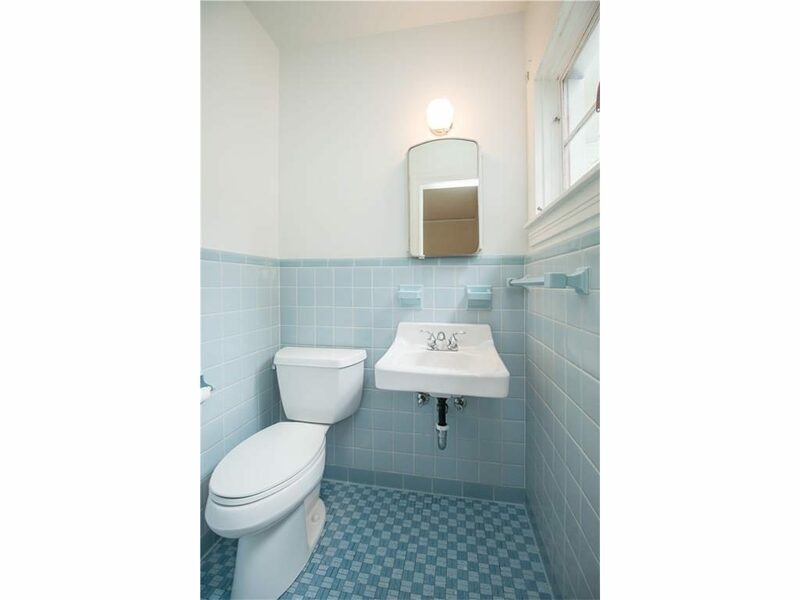 The master bathroom at Flip 5…well, master bathroom is a little generous. The powder room adjacent to the master bedroom (much more realistic) has been a neglected little corner of the home for six months. The toilet wasn’t working, the sink had been without a faucet since summer, the light fixture was cracked, and I can’t even remember the last time I cleaned in there! 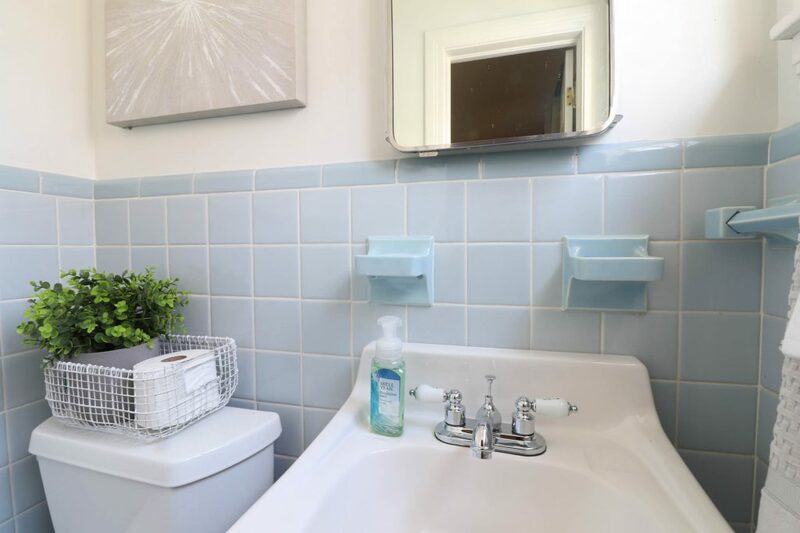 Without much planning, I decided to tackle a weekend bathroom refresh in there so I could have another functioning bathroom & could stop looking at a broken bathroom! If you’ve been around here long enough, you know there wasn’t a chance I’d ever get rid of that beautiful vintage tile! It’s in pristine shape, and I love it. While I don’t love the current sink situation, it works so I didn’t see a need to replace that. The faucet, however, had broken and the drain was leaking. I loved the vintage built-in medicine cabinet, mainly because storage is so limited in this house but also because of the throwback charm it adds. 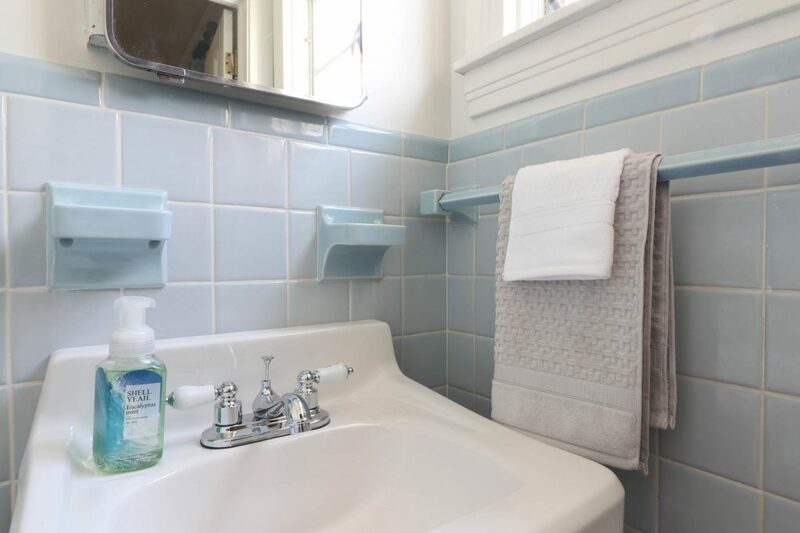 For the weekend bathroom refresh project, my main goal was to make everything working, clean, and pretty again. This wasn’t a major renovation project- it was simply a weekend refresh! I didn’t want just any faucet. Instead, I wanted something that looked vintage. I was able to pick up this chrome & write faucet at Home Depot for less than $40! I had never installed a new faucet, and after a quick look at the directions, I was shocked how easy it was to install! I’m a big advocate for soft & luxurious linens in a bathroom. It’s one of the few simple treats we can add to our daily lives that makes our space feel little more like a spa. 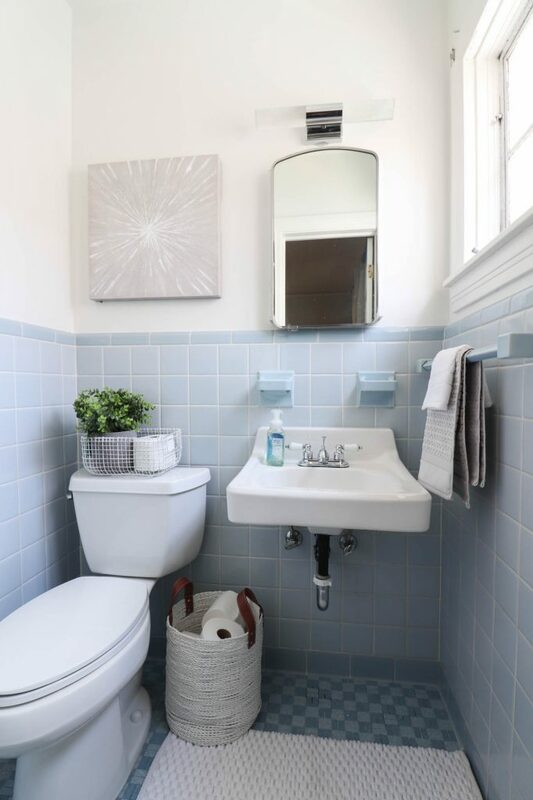 For this bathroom refresh, I got mine at TJ Maxx because they have a great selection, & they have great prices! 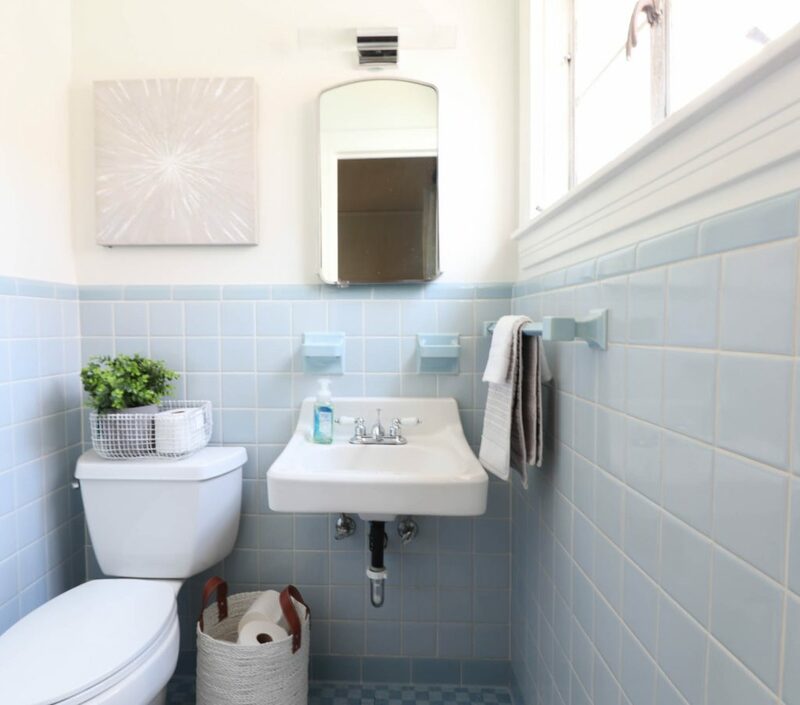 I opted not to paint the walls because the white really is the perfect neutral to pair with the blue tiles, I chose some muted colors as accent with a pop of greenery for color. The small basket & faux plant came from TJ Maxx. Previously nothing was on the walls, & I wanted something to break up all the white. I found this unique hand painted piece at TJ Maxx. It’s neutral with a hint of sparkle & blue. 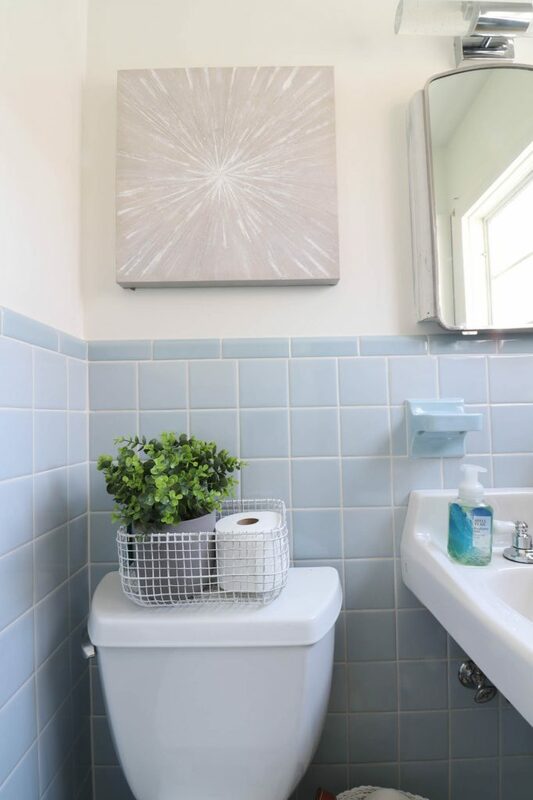 Even swapping out art or adding some to a space can make a big impact for a bedroom or bathroom refresh! Previously, not only was the faucet not working, but the drain was leaking as well. Much like installing a faucet, I had never attempted to fix that before. After a couple YouTube videos, one mishap that flooded the bathroom (yikes! ), and one J-bend replacement, I had the entire drain repaired with no leaks. I can’t tell you how empowering it is to tackle new projects– and succeed! There is virtually no storage in this bathroom, so I had to get creative. I picked up a handled white basket at TJ Maxx to hold additional toilet paper. Tip: Baskets are a great way to storage essentials that aren’t pretty but the basket adds some charm. You pick up affordable baskets at big box stores or at thrift stores. My last two changes to the bathroom refresh were a super plush bath rug & a light. I wanted to soften the space since there is so much tile. I tend to always pick very plush rugs because they add a touch of luxury- and who doesn’t love that? This one was only $12 at TJ Maxx. My last addition might be my favorite! I swapped out the broken light fixture for a really fun vintage-inspired lucite & chrome light from Lowe’s. My brother in law taught me how to do some minor electrical work like hanging new lights, so I was able to tackle every bit of this project myself this weekend! I opted for money from my home warranty company rather than have them fix the toilet & faucet. With the cash in hand from the home warranty, I only had to spend about $80 out of pocket and a snowed-in weekend freshening up the space. Even though I’m the only one that sees it, I’m so glad to have it clean, functioning, and stylish! *Paint! Even though I opted not to paint, a fresh coat of paint can make a big change to a room. *Swap out accent colors. 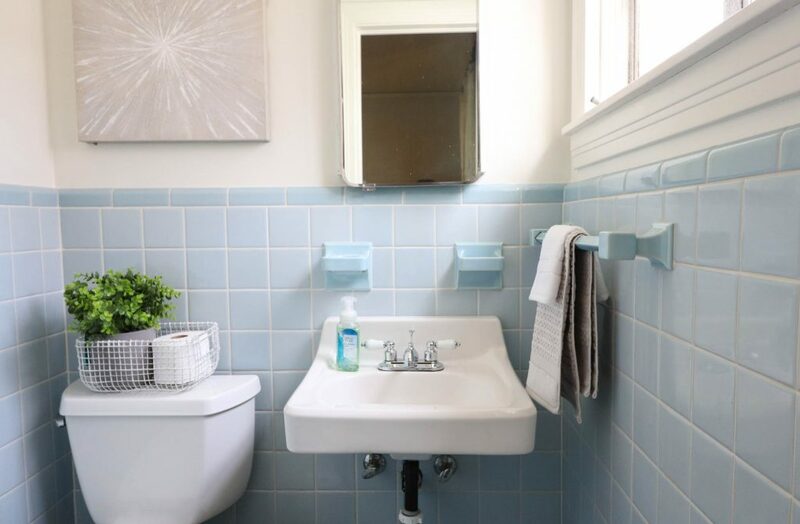 Have you always use blue decor in your bathroom? Try adding in a new color to give the space a fresh look. *Find pieces of art you love (or make some like these) to add visual interest to your walls. *Clean out your cabinets & trash what you don’t need, don’t use, or that might be expired. *Store clutter out of sight.